I was born, in what Carl Jung would have insisted was no coincidence, on the site of an old pub, the Upper Flask in Hampstead, near the Heath. The pub closed in the second half of the 18th century, and the building that housed it was replaced in the early years of the 20th by Queen Mary’s Maternity Home. Today it’s nursing accommodation for the Royal Free Hospital, but over the decades tens of thousands of babies must have been born there. I wonder if we all like beer. If you walk down Heath Street from the site of the Upper Flask towards Hampstead Tube Station you come to the side-road called The Mount. In 1852 the painter Ford Madox Brown, who was lodging in Heath Street, spotted a gang of workmen digging up the road here to lay drains and decided what a marvellous picture these heroes of labour would make. It took him 11 years to complete the painting, which he called, simply, “Work”. But it is an allegorical masterpiece typical of the pre-Raphaelite period (though Madox Brown was not, strictly, a member of the pre-Raphaelites), where every character of the more than two dozen portrayed, from the gentleman earning £15,000 a year to the effeminate flower seller, has a back-story. It’s also still recognisably the same scene today, 155 years later, as you will see if you stand by the high brick wall on the left of the painting and look north: except the upper middle classes now go past in BMW X5s rather than on horseback. Madox Brown wanted his painting to illustrate the nobility of honest toil, but labour needs sustenance and refreshment, and one of the navvies is draining a pewter pot of something uplifting and alcoholic – porter, probably, given the era. 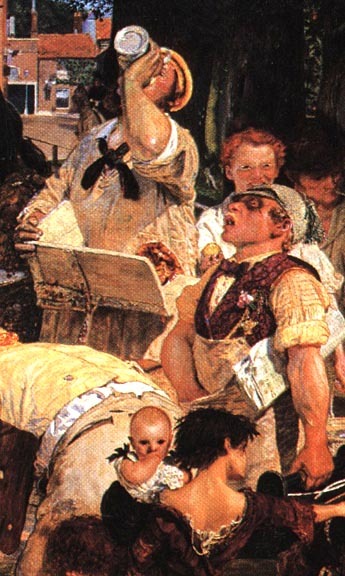 In front of the drinker, and shouting “beer ho!”, according to Madox Brown, who wrote notes about all the people in the painting, is the fellow who brought the navvy the beer, the potman from one of the nearby pubs. He is fancily dressed in bowtie and waistcoat, and wearing the apron of his calling, and in his left hand he carries the potboy’s beer tray or pot-board, rather like a carpenter’s wooden toolbox, which bore eight or ten beer pots and, on the top, clay pipes for those who wanted a smoke with their beer. As an example of truth in marketing, Charles Martell’s Stinking Bishop cheese is tough to beat – it really does stink enough to waken the dead, according to the Oscar-winning Wallace and Gromit film The Curse of the Were Rabbit. which climaxes with Gromit reviving his master by waving a wedge of the cheese under his nose, whereupon the aroma of three-month-old unwashed socks drags Wallace back to life. Stinking Bishop is the name of the pear, more properly called the Moorcroft pear, used to make the perry that is used to wash the rinds of the ripening Stinking Bishop cheeses at Mr Martell’s Laurel farm in Dymock, Gloucestershire. The washing with perry encourages bacterial growth on the rinds, and the bacteria produce the pong, though the cheese itself, made in part with milk from rare Gloucester cows, is delicious. It’s one of the few cheeses I’d hesitate to eat with beer: because of how it’s made, a sharp, dry perry is probably the best companion. However, a sulphury Burton bitter, particularly Marston’s Pedigree, also makes a good match: pong against pong. Mr Martell’s other offerings include Hereford Hop cheese, covered in toasted, pressed hops, another cracking product just the crumbly side of firm. It makes excellent cheese on muffins, terrific for afternoon tea with Timothy Taylor’s Landlord bitter from Yorkshire, itself one of the most perfectly balanced matches of hop and malt flavours I know. All beers go with cheese, the carbonation and the bitter hops preventing the palate from getting too clogged, though Yorkshire beers (and I say this as a southerner) do seem to pair particularly well with cheeses, especially with Yorkshire cheeses: try Swaledale with Black Sheep bitter for example (and if you can find the rarer ewe’s milk Swaledale, you’ll be eating sheep’s cheese with sheep’s beer …) Here’s half a dozen pairings, however, that include only one Yorkshire beer: some are not great beers, some are not great cheeses, but all are excellent combinations that are certainly grater than the sum of their parts. Corrected June 20 2008 to adjust for more accurate information – see this post. The economic values displayed on eBay sometimes bemuse me. Last October a copy of the first, 1974, edition of the Good Beer Guide went after frenzied bidding from what I assume were completists wanting to own a full set of GBGs, for a frankly breathtaking £310 – not bad for something that cost 75p when it was published 33 years ago. Yet a couple of months ago I was able to buy on eBay one of the most important documents in the history of brewing, a genuine example of The Gentleman’s Magazine dated November 1760, for just £20. The reason why this edition is so valuable to brewing historians is because it plagiarises large parts of a long letter written in a rival publication, the London Chronicle, in the same month by someone calling himself “Obadiah Poundage” on “The History of the London Brewery” (“brewery” used here in the 18th century sense of “brewing industry. , but with one small yet very significant difference.